That Cardi B and Nicki Minaj collab we’d all like to hear is still a long way off. The rappers’ feud has reignited on social media and this time Little Mix have been brought into it. 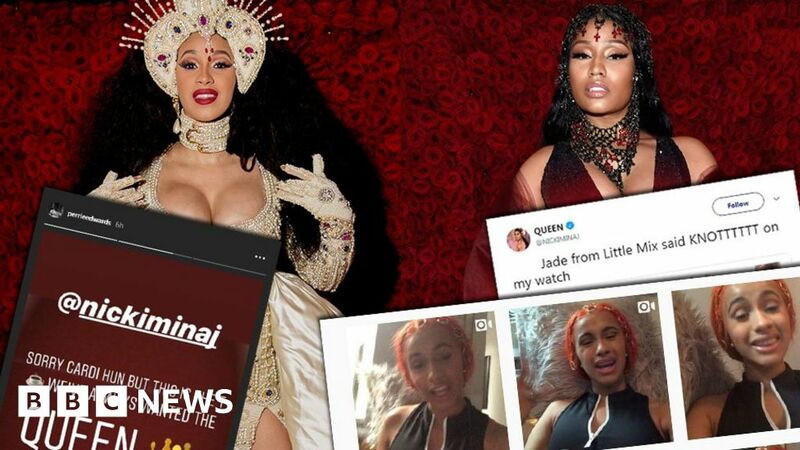 Cardi B posted 10 Instagram videos on Tuesday lashing out at Nicki over comments she made on her Beats 1 radio show. She then went on to make claims about the Little Mix song Woman Like Me – which Nicki features on – saying she was originally asked to appear on it. Okay, so what’s the latest? On Monday’s episode of Nicki’s Beats 1 radio show, the rapper made several comments about Cardi B and addressed THAT fight again. Remember? A scuffle broke out between the two rappers at a New York Fashion Week party in September. Nicki has now claimed her friend, former Love & Hip Hop star Rah Ali, was responsible for attacking Cardi during the incident. The Anaconda star also claimed Cardi had interfered in a track she recorded with Offset, London On Da Track and 21 Savage. Oh, and there’s more. Among other things, Nicki denied leaking Cardi’s phone number and said she needs to “stop lying on me”. But Cardi had her own take on the latest claims. Addressing Nicki in a video on Instagram, she denied Rah had been the one who had attacked her. She went on to say: “How you say that I was the wild animal, that I attacked you, that you was mortified, that you was humiliated, playing the victim. “But now you’re the gangster. You need to pick a side. Do you want to be the victim or the gangster? Once she’d addressed that, Cardi decided to pick up on other issues she has with her hip hop rival. One of her big claims was about Little Mix’s Woman Like Me song. “That Woman Like Me record? I had to decline it because I’ve got a lot of pop records, so I can’t over-exaggerate myself,” Cardi said. Cardi also said Nicki’s recent fashion campaign with Diesel was also offered to her first. What have Little Mix said? The group later tweeted to explain that both Cardi and Nicki had been approached to appear on the song but they chose the Super Bass star. The Little Mix girls have certainly mentioned their love for Nicki often enough. And Jade Thirlwall appeared to side with Nicki when she liked her response to Cardi’s comments about Woman Like Me. Just over a year ago, Nicki Minaj was congratulating Cardi B on her Billboard Hot 100 number one Bodak Yellow. They both then featured on Migos’ 2017 hit Motorsport. But fast forward a year, things are very different and since their altercation at New York Fashion week, their dispute seems to have gone beyond the usual “beef” showmanship between rappers. Nicki Minaj claims Cardi B doesn’t show her “respect”, yet Cardi B claims that’s all she has done since she was a teenager listening to Nicki’s music in school. It does seem a shame though that the two leading female rappers in the world right now, actually can’t seem to get on. In terms of publicity, it does neither any harm for their arguments to be played out in public – especially when they both have music to promote. So can Cardi and Nicki ever put their differences aside? There’s still hope for peace between two of the world’s biggest female rappers, with both ending this most recent clash with an appeal for peace. In her ninth Instagram video on the subject, Cardi said she is “sick and tired of the back and forth” and says she and Nicki can “link up” and settle it. Nicki, meanwhile, wrote on Twitter than she would not be speaking about any feud with Cardi B again. Newsbeat has contacted representatives for Nicki, Cardi and Rah Ali for a comment.